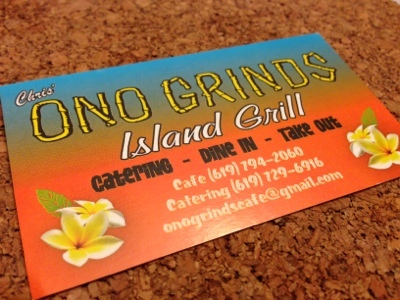 Chris' Ono Grinds Island Grill was a recommendation for catering at my work party in April. Chris, himself, was great to work with. He ensured that we had the right amount of food for the number of guests we were having and he stayed within our budget. He even threw in a salad at no charge. 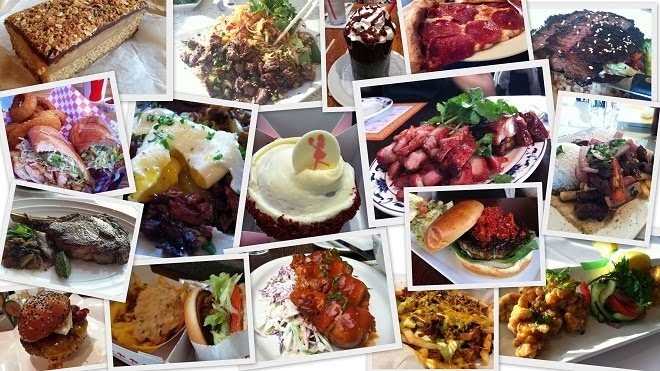 Everything was so "ono" and everyone enjoyed the food. Yay! So, I craved their food one work day and decided to call in an order. I seriously didn't want the whole entree because I was also going to order two spam musubi as an appetizer. I ordered a small kine plate with their famous huli huli chicken with mac salad. 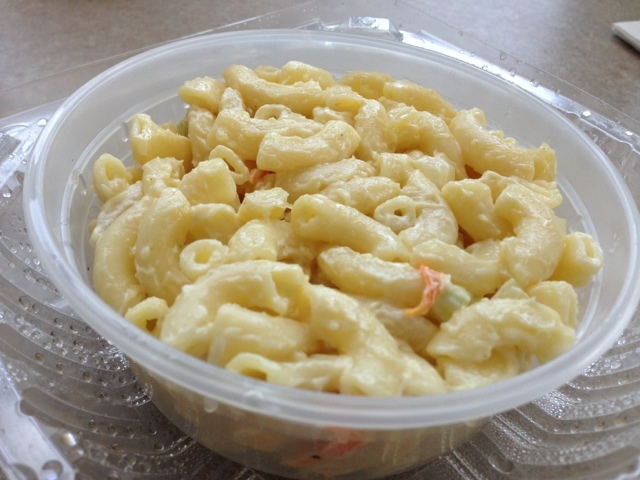 You gotta have mac salad at a plate lunch restaurant! After fighting through the hellish traffic on Mission Gorge Road to get back to work, I opened the plastic bag to reveal my food. Um, I think I ordered a kid's meal... for me. The portion was really small... I just think that the "small kine plate" I ordered was really a kid's meal. 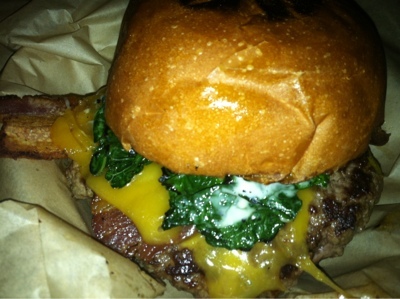 Surprisingly, their menu now does not have the "small kine" plates anymore. 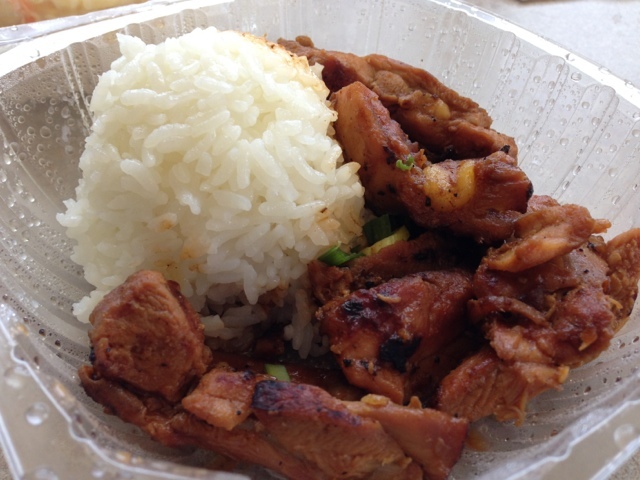 I ordered a small kine plate with huli huli chicken and mac salad ($6.49). The size of the scoop of rice was like a golf ball and a half. The portion of the chicken was about one flattened out chicken thigh (picture one of L&L's BBQ chicken and then cut in strips). Flavors were good - but I ate it all in a few bites. But, the chicken was a bit dry by the time I got back to work. I blame it on the traffic on Mission Gorge. The mac salad was a nice size portion. The simple flavors reminded me of my mom's mac salad - macaroni, carrots, celery, I think there was onion, and not too much mayonnaise. It was yummy. The spam musubi (2 for $4.99) were just okay. The spam slices were cut way too thin and all I really tasted was the nori (seaweed) that was wrapped around it. I did like the soy they put on the rice. 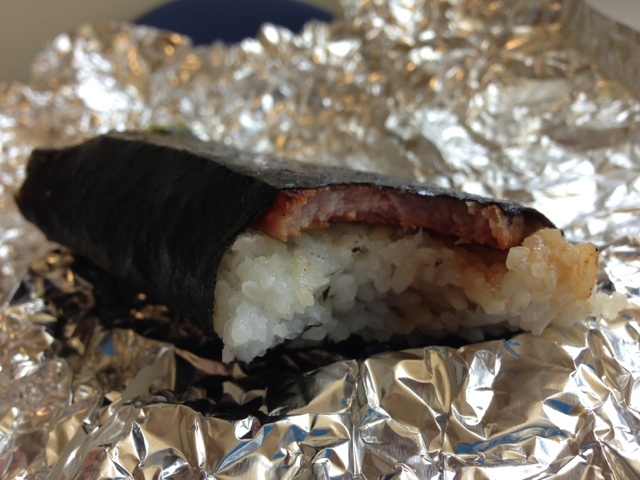 It gave it a nice salty touch since the salty flavor of the spam was pretty lacking. 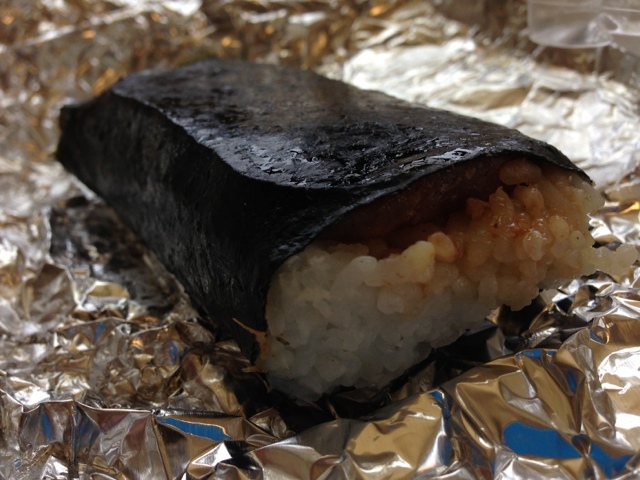 The musubi was very flat too. 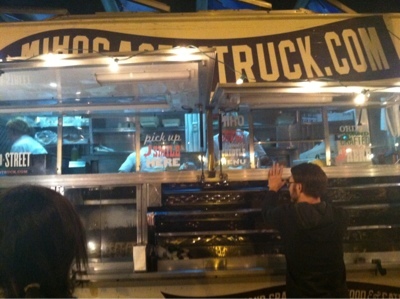 I really did enjoy having Chris' Ono Grinds during our work party. Everything was really delicious - the huli huli chicken was moist and saucy, the kalua pork melted in my mouth, the vinaigrette in the salad was heavenly, garlicky and super flavorful, and even the tofu stir fry for a couple of vegetarians was deliciously fresh. We also had soft Hawaiian rolls too. Yum! My take out order was just a tad different experience. The small kine plate, that they don't have anymore, was overpriced at $6.49. I paid over $14.00 (including a takeout tip) but my meal wasn't worth what I paid. 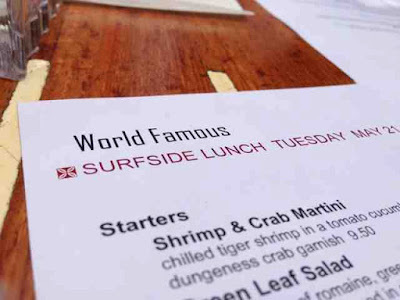 World Famous in Pacific Beach is the hubby's family's favorite place to go for brunch when they are in town. 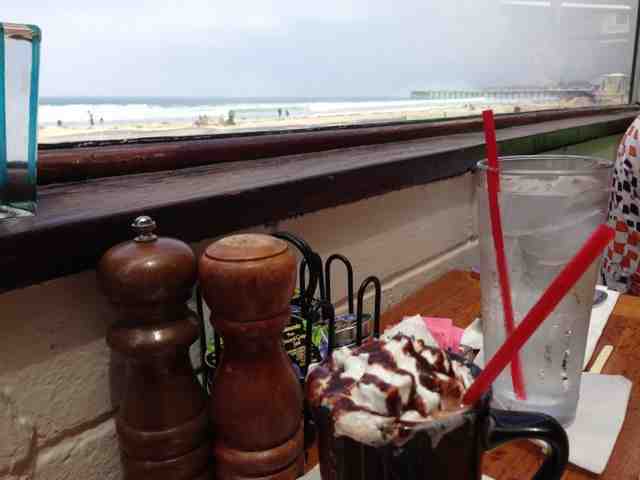 What more can you ask for when you are near the beach? I have never had a bad meal here. Yeah, this place can be touristy but we, the locals, enjoy it a lot especially for their breakfast items. We visited on a Tuesday around 11:00am and we were sat immediately in the outside patio near the boardwalk and the ocean. We always have to sit outside even when there is a long wait. 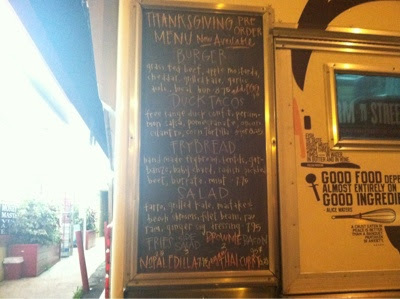 There is something on the menu we all enjoy and it is surprisingly the best hot chocolate.. ever. Right? At World Famous??? YES. Here it is -- their 'World Famous' hot chocolate. 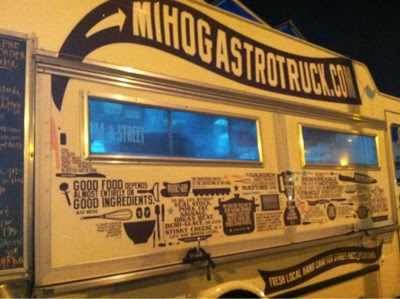 I have never asked them what makes it so good, but maybe the next time we visit I will. 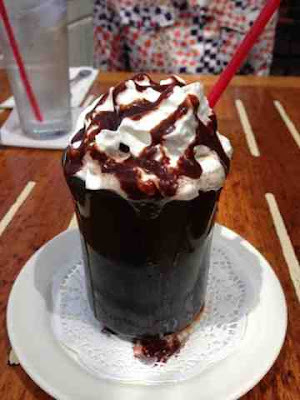 It arrives with a heaping amount of whipped cream and drizzled chocolate syrup. It is sweet, chocolately and super creamy -- none of that watered down hot chocolate nonsense from a machine. I cannot come here for breakfast and not order one. So freaking good. They brought us a lunch menu and I was stoked that they have late breakast portions. 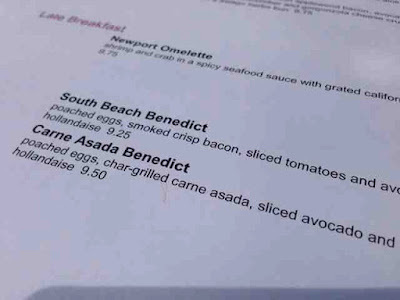 I love their eggs benedicts! 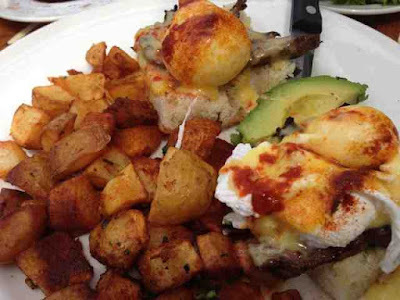 The South Beach Benedict is what I usually order because I love the combination of crisp bacon, creamy hollandaise, egg, fresh tomato and avocado over a bite of buttery, toasted bread (instead of English muffins).... read my previous experience here, but I wanted something more savory, a bit heavier, and with *beef*.... CARNE ASADA benedict! The Carne Asada Benedict ($9.50) comes with their delicious breakfast potatoes, sliced avocado, grilled marinated carne asada, poached eggs with a drizzle of salsa on each one. 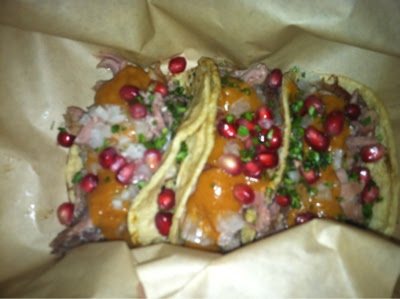 The presentation is not the greatest here, but the flavors sure are yummy. 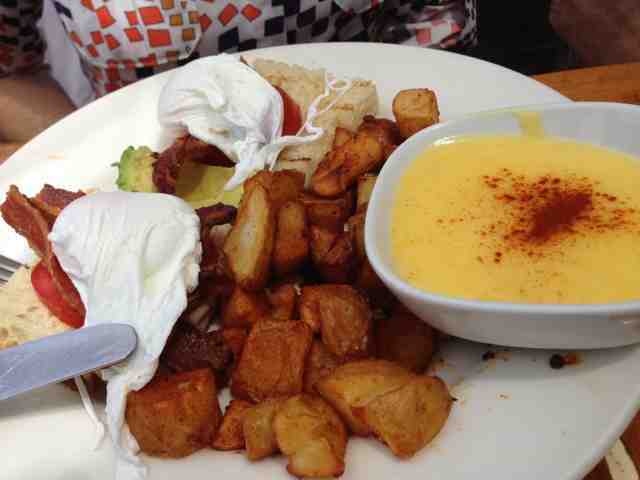 Despite the lopsided poached eggs, the yolk was runny and cooked well. 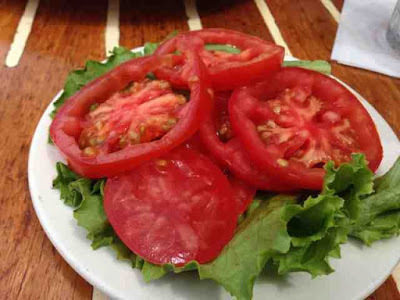 What I love about the South Beach is the crunchy bite of the fresh tomato. So, I asked them to put tomatoes in my benedict, but our server said, "Ok, I'll give you a side of tomatoes." Um, okay... thanks! But, it was quite all right because I ended up eating them all but one from this plate. They were sweet and they went so well with every meaty bite. 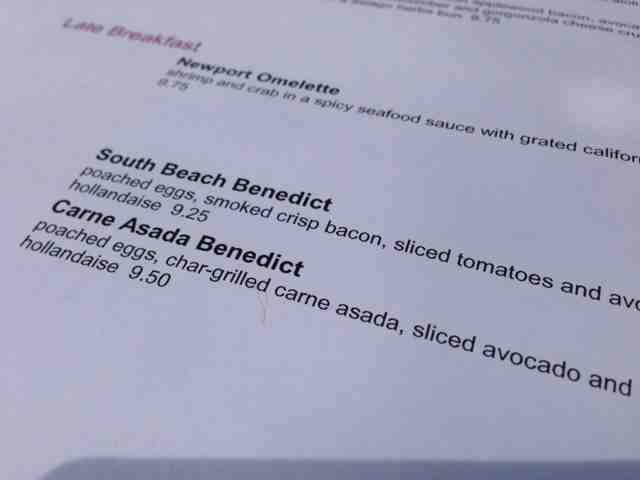 Haha, here is the South Beach Benedict ($9.25) with the hollandaise on the side. I am laughing because whoever was at the egg poaching station failed quite miserably this day. Almost looks like marshmallow whip. However, they still were cooked well - nice and runny. 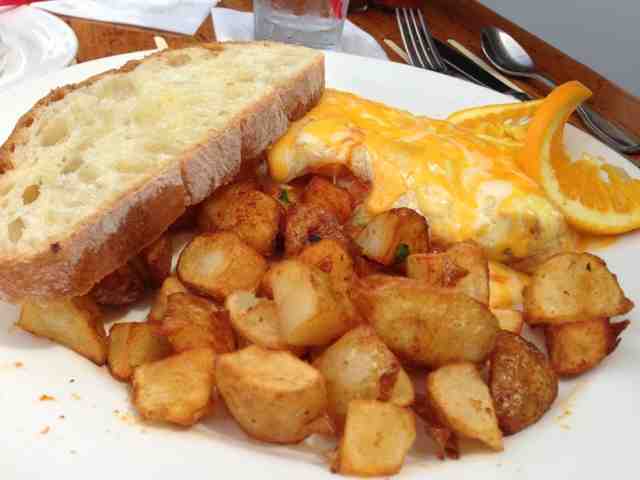 My hubby ordered the Newport Omelette ($9.75). I was so into my food that I didn't even get a picture of what a bite would look like. This cheesy omelette comes with shrimp and crab. Mmm, I had a bite of it was really creamy and flavorful. 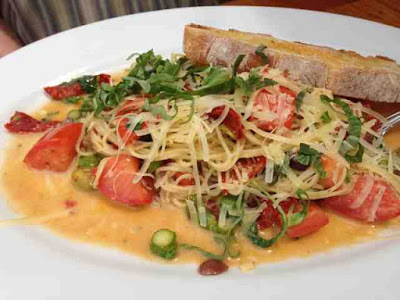 Lastly, here is the angel hair pasta, which I did not get the name of, nor the price. Too bad the World Famous website does not have the description of this pasta dish on there. It had kalamata olives, asparagus, fresh tomato, basil, and sundried tomatoes. Because I do not like olives, I did not have a taste, but he enjoyed it very much! All in all, we really enjoy being near the water and under the sun, near the beach and we enjoy people watching at World Famous. Parking is easy -- in the underground parking structure next to the restaurant. They validate for, I believe, the first two or three hours. I am sure we will be back the next time the family is in town, or if I have a sudden craving for the hot chocolate!